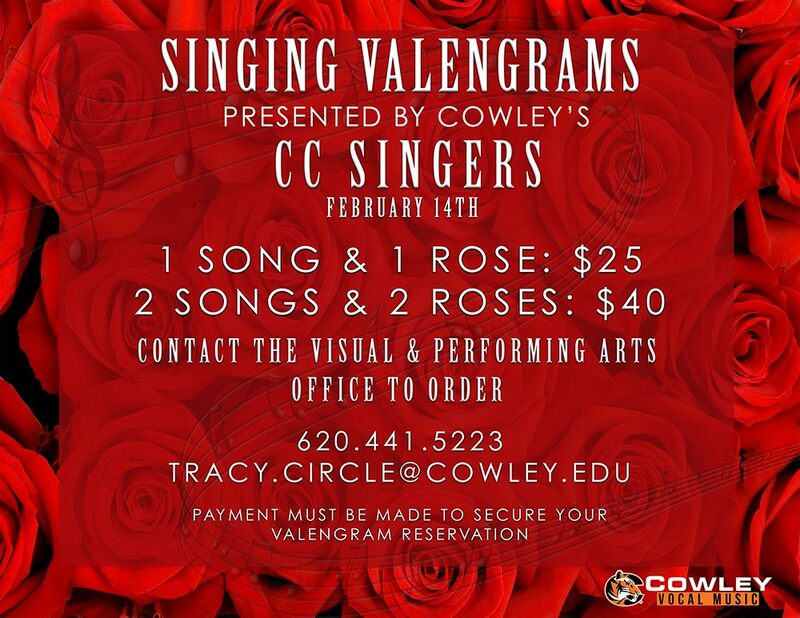 To order your Singing Valengram or for more information, contact the Visual and Performing Arts Office at 441-5223 or at tracy.circle@cowley.edu. For just $25 the Cowley College Singers will deliver one rose and one song. Two roses and two songs is $40. All deliveries will be made on Thursday, Feb. 14 in the Arkansas City and Winfield areas only. All proceeds go to help support the Cowley College Singers. Song selections include: My Guy, My Girl, Let Me Call You Sweetheart, I Love You Truly, Can’t Help Falling in Love, Hooked on a Feeling, I’ll Be There, and Happy Together.